Act 2 - The Rescue! The women were left trapped in their house with zombies all around. Not only one farm had seen a similr fate, farms all over the front had fallen prey to the German LeicheKampfer... The Soviet generals heard the distress calls from the resistance fighters, but didn't understand them. "rescue us!" the partisans cried. They would rescue them from whatever the Germans could throw at them! Pavel's squad! They are shown from the back so their names can be seen! Soviet motor rifles were sent out all over the front to determine what was going on and get anyone out that they could! It just so happened that two squads of motor rifles found their way to our little farm. To see what happened at this farm, please read Act 1. All of the zombies from the previous battle (Act 1) will also fight in this battle (There should be at least five, but it depends on how many women were zombified! In our case it was only one, so ther are six zombies). One figure should be designated as platoon leader (yes, I know two squads don't make a platoon, but lets pretend they do for this one okay?). Two other figures should be designated as leaders for the two squads. In this case Rustam is the platoon leader, while Pavel and Berendie are the squad leaders. Berendie's squad! They are shown from the back so their names can be seen! This game has the same layout as the previous game (Act 1). 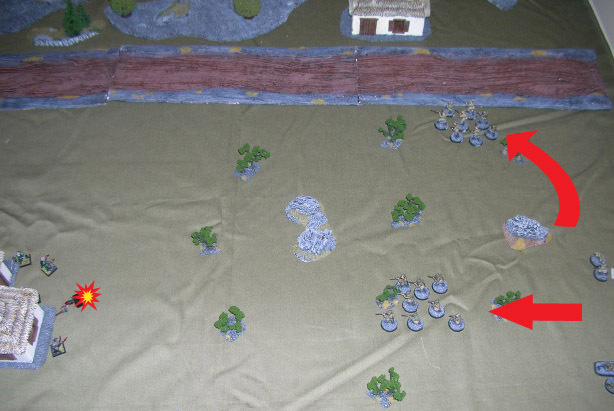 The Soviet squads are not deployed on the first turn. They arrive on the first turn from the northern board edge. The zombies start this game around the large farm house. The women are still in the house as well, and should be placed there at the outset of the game. 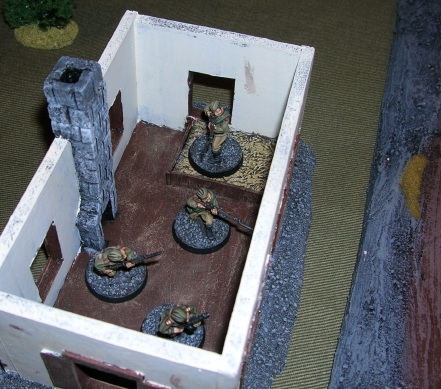 To satisfy the victory conditions the Soviet squads must explore both farm houses, the little one and the big one. They must then take any survivors (in this case the women) and lead them off the board that they entered from (which is where their parked tanks are assumed to be, but no, you cannot use tanks in this game!). The Battle - The Soviets meet their new enemy! A moment later they were ready to disembark. After a quick word with the squad leaders they were ready to go. Both houses would be checked and all people found would be questioned and sent back to the NKVD for further questioning... "Lets go!" he called to his troops and they were off! The squad leaders ordered their DPM light machine guns to set up and Pavel's squad went toward the little house, while Berendie's squad went to the bigger house. That was when the trouble began. Berendie took one look at the people around the large house and barked an order to take them down. They were covered with blood and looked ravenous. Shoot first and ask questions later was his motto, and so he did. One other of his squad, a rookie named Molovo, shot as well, but missed. Berendie himself hit his target in the chest and knocked it down... One down, five more to go... Or was there one down?!? The squads deploy. Berendie's shot took down one zombie, but not for good! As Berendie and Molovo's shots echo through the air, two more people (corpses?) appear in the distance, running toward Berendie's squad at full tilt. Not only that but the people (corpses) surrounding the large house also begin to sprint toward Berendie's squad... Even the one Berendie shot got up and sprinted toward his squad. But Berendie wasn't a rookie. He had seen the German PanzerKampfSoldat (armoured fighting soldiers), and so perhaps these people (corpses?) were wearing armour to protect from bullets! As the people (corpses?) sprinted toward his squad, he told his men to open fire! As the bloody corpses come screaming toward the soldiers, they let loose with all they have. Shots ring through the air from rifle and sub machine gun alike, but aside from Berendie's shot knocking over one of them, there is no effect. The squad stands in awe as bullets rip through the corpses without even slowing them down! But that is when Nikolai opens up with his DPM light machine gun. Nikolai manages to put down two for good, but on the horizon, two more can be seen charging towards the noise of gunfire! In the face of the gunfire the corpses kept coming. They were on top of Berendie and his squad before anyone imagined. The firm resolve of all of the glorious soldiers of the Red Army held firm though and they took the charge, some with guns blaring, but to no avail. Sasha was knocked down by the ravening zombie, but luckily he was not bitten! Avdei and Sergei managed to knock down some zombies as well, but none were taken out for good! 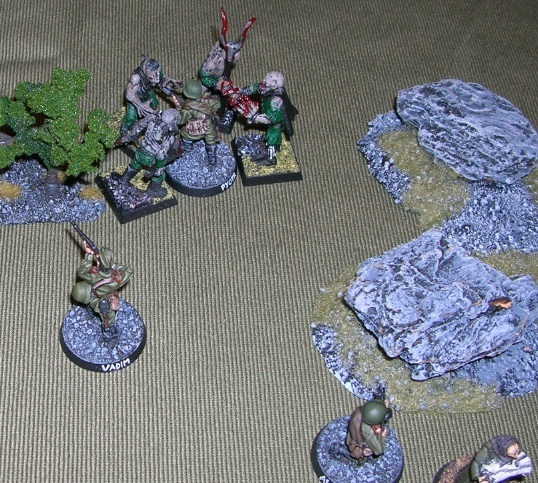 The zombies close in on Berenidie's squad! The zombies knocked down during the fighting sprung to their feet and dove back into melee with Berendie's squad, eager to taste some flesh. This time however the soldiers had recovered their horror and were ready to take the fight to the corpses. Rustam ordered everyone to hold their fire and draw their sharpened shovels and bayonets. The melee that followed saw Sergei decapitate one zombie with his bayonet, Rustam decapitate another zombie with his bayonet, and Gridya sliced the top of the head of a third zombie with his sharpened shovel. Molovo and Sasha managed to knock down the zombie they were fighting as well. Rustam whipes his blade, but holds his nerve as his men do the same! In the mean time, the men Pavel took to the small house reach it and break down the door in search of survivors. Aside from a straw mattress and a table with a cooking knife the place is empty. Nobody home. Pavel takes a quick look around and orders his men back out of the house. Pavel reaches the small house, but finds nobody there! After finding nobody in the small house, Pavel leads his men right into the charging line of a zombie! Just as Molovo regained his feet the rest of Berendie's squad along with Rustam and the rest of Pavel's squad continued to battle the zombies in a tooth-and-nail hand-to-hand fight. Vadim. and Avdei managed to seperate the heads from the bodies of a couple of zombies, while Lesta and Sasha managed to keep their zombies on the ground. Molovo continued to fight with the zombie that bit him but neither were able to get the upper hand on the other. The Soviets begin to win the melee with the zombies, with the exception of Molovo in the bottom right of the picture who has been bitten! Meanwhile Pavel charged out of the small house and right into the line of site of a charging zombie. 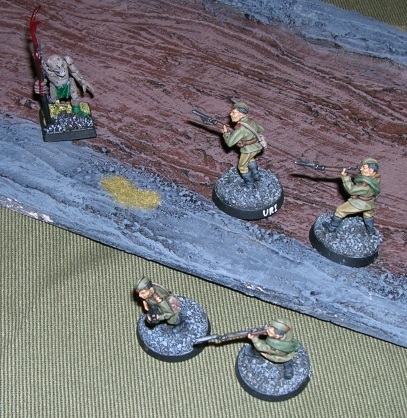 The zombie quickly veered away from its initial target and attacked Uri, one of the rookie soldiers that was with Pavel. Uri, startled with the horror of being attacked by a ravening corpse stood by while it mauled him! His lifeless bodie hit the ground, but only for a moment before it rose in undeath, thirsting for the flesh of its former comrades! "Uri! Nooo!" Pavel yelled in horror as Uri fell to the ground, only to rise again in undeath! Pavel pulled himself together and lead his remaining men, Mikhail and Kostya, toward the large house. As Pavel ran towards the large house both Alexie and Gridya arrived there with Vadim close behind. Alexie quickly checked the house for enemies and then made sure everyone inside was okay. The women and children cried with relief as Alexie told them they were to be saved by the glorious soldier of the Red Army! Alexie and Gridya bring the good news to the women and children in the large farm house! "You are to be rescued" he said with happiness! As Pavel lead his remaining men away, the zombie formerly known as Uri came into view of Rurik and his DPM light machine gun. Rurik let fly with the 7.62 rounds and removed Uri's head from his body, as well as another zombie. Nikolai also took aim but misses his target. Unfortunately for both, three zombies emerged from the fields, drawn by the sound of gunfire! The zombies continued to bring the fight to the main group of soldiers made up of Berendie's squad along with Rustam's men. In the fighting Lesta and Avdei severed the heads of their undead attackers with their trusty sharpened shovels. Vadim also managed to take out a zombie with his bayonet near the large house while Mikhail held one off. Unfortunately Molovo was not so lucky... After being mauled again by his undead attacker he too rose from the ground in undeath and turned on Sasha! The Soviets, distracted by all of the zombies appearing from the fields covered in rotting blood failed to take the initiative and the zombies charged (The Soviets failed to activate this turn, which means they didn't move and could only react!). Fierce melee continued. Pavel managed to hold off a zombie that charged him, while both Mikhail and Sasha fell to the ground, mauled and half-eaten by their attackers! Both rose in undeath within moments! Avdei looks on in horror as Sasha dies and rises in undeath! Shaken out of their inactivity by the horror of what happened to Sasha and Mikhail, the glorious Red Army soldiers sprung back into action. Alexie and Gridya lead the peasants from the large house, managing to move very quickly they make great speed! Pavel, seeing the need to ensure the women escape to safety called for Vadim and Kostya to charge the nearest zombie Pavel lead the charge and the zombie's head was neatly severed from its body! Alexie and Gridya lead the women to safety while Pavel charges the lone zombie closes to the large house (top left of the picture). 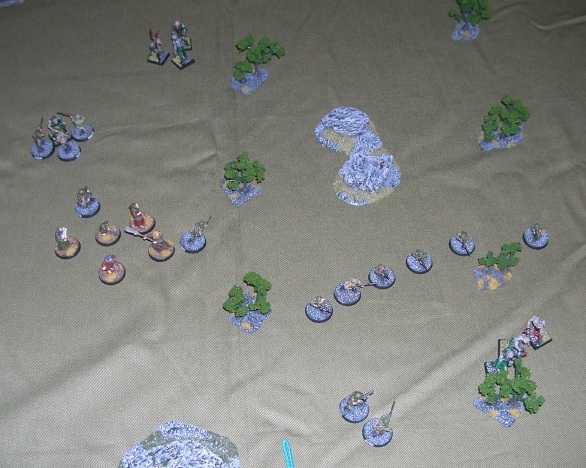 Meanwhile Berendie's squad leaves melee to gun down the three zombies that remain in the path of escape (lower right corner of picture). While Pavel's men dealt with their zombies with bayonets, Berendie made the call to pull out of melee and to blast the zombies into dust with gunfire; they had to be removed from the line of retreat of the rescued women and children. Gunfire errupted from everyone with a line of sight to zombies formerly in melee. Nikolai's DPM took the head off of Sasha's reanimated corpse. Lesta relieved Molovo's reanimated corpse from its head as well, while Pyotr put down the last zombie in the escape path. As the echoes of gunfire died down, two more zombies appeared from the forest, stirred by the sounds of battle. 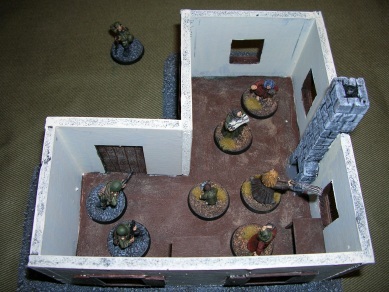 Again the zombies gained the initiative on the Red Army soldiers (again the Red Army soldiers failed to activate!). The zombies sprinted from the fields continued to close, while Kostya, one of the men with Pavel was charged by three zombies. Kostya fought valiantly, but to no avail. The zombies pulled him down and feasted on his flesh. Within moments his corpse roses in undeath! 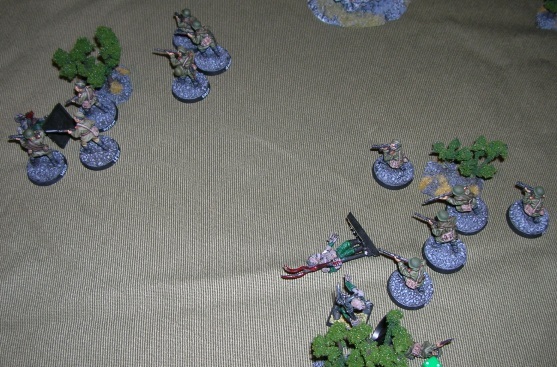 Pavel, in his rage over losing Kostya decapitated the zombie he was fighting while Naum, the second in Rurik's DPM light machine gun team, managed to gun down a zombie that was charging him! Unfortunately his gunfire drew one more zombie to the battle! Berendie yelled for his men to move and they did (finally!). Alexie spured the women and children on and everyone followed. Pavel, realizing that someone would have to fight a rear-guard action ordered Vadim and Pyotr to the task and himself ran ahead with Berendie and Rustam. The Soviets break off the fight and head for home! Pyotr and Vadim prepare to fight a rear guard action against the pursuing zombies. A brutal rear guard action was indeed fought. Vadim and Pyotr, realizing that their chances of survival were not good, both went against orders and opened fire on the pursuing zombies, but to no avail. And as a consequence two more zombies found their way to the field of battle. 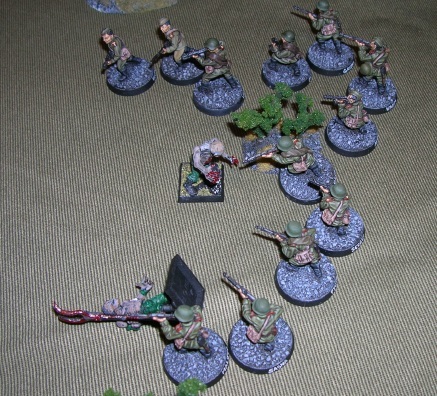 Just as the rest of the Red Army soldiers lead the women to safety, first Pyotr and then Vadim were dragged down and eaten... They made a noble sacrifice for the greater good of the people! 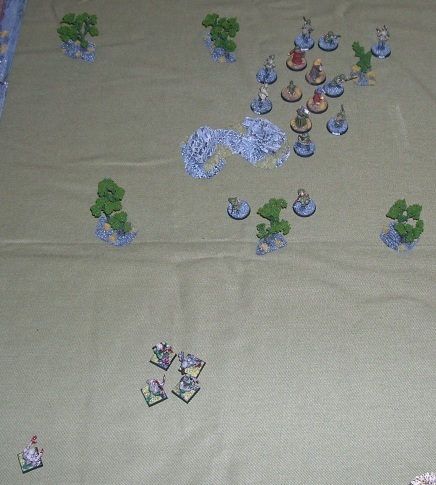 Pyotr fights his last fight while the women and children are lead to safety! What a valiant fight that was. The Glorious Red Army soldiers fought a great fight against the undead horde. They managed to rescue all of the women and children and accomplish their task of checking all of the houses. Unfortunately many were lost in the fight, and some where seasoned veterans... Still, the success of this battle brings hope that not all is lost in the face of the sinister science of the German warmachine!